Papercrafters in the United States create cards in relatively standard sizes. Typical dimensions of handmade greeting cards stem from standard paper sizes resulting in the most common sizes of cards: 4 1/4 inches high by 5 1/2 inches wide and 3 3/4 inches high by 8 1/2 inches wide. These rectangular card sizes fit in standard envelopes within the constraints of a "First-Class Mail Letter" postal rate as defined by the USPS. A "Letter" size ranges between a minimum size of 3 1/2 inches high by 5 inches long to a maximum size of 6 1/8 inches high by 11 1/2 inches long. A square card made from 12-by-12 piece of scrapbook paper results in a card othat is 6-inches square. The use of square envelopes invokes the post office requirement of additional postage. The use of beads or eyelets as embellishments increases the final envelope thickness. Shipping handmade cards with beads or eyelets often warrants the use of additional padding material in the envelope to protect the embellishments from the automatic sorting machines. The greater thickness of padding can increase the postage amount for an embellished card. 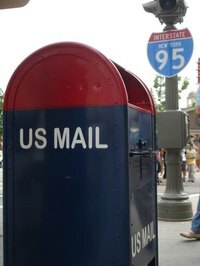 The USPS requires a higher postal rate for a "First-Class Mail Large Envelope" if the thickness ranges from over 1/4 inch to 3/4 inch. The USPS allows the "Letter" postal rate for cards weighing up to 3.5 oz. Unless the card has particularly large beads or eyelets as embellishments, rarely does it exceed the weight limit. Cards heavier than 3.5 oz. fall into the higher "Large Envelope" postal rate. The safest approach to sending a thicker or bumpier card with beads or eyelets may be hand canceling a stamp in person at the post office. Although the sender must wait in a line at the post office to accomplish this extra step, the benefits outweigh the extra hassle. The sender eliminates the uncertainty of the card surviving the postal sorting machines. The USPS verifies total postage amount to ensure prompt delivery. Finally, hand canceling provides a personalized touch for that handmade card with beads or eyelets. The USPS provides an online postal calculator to give up-to-date postal rates for all the variables of shipping handmade cards, which may be odd weights, dimensions and thicknesses. The postal calculator lends the advantage of prompting the user for unexpected postal requirements or costs for additional specialized services.